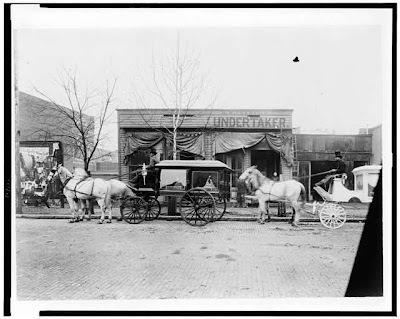 Well, it's the Day of the Dead, Dia de los Muertos, and what better topic than undertakers? A while back, I posted about the development of embalming practices during the Civil War. The primary practitioners of embalming ultimately were undertakers, although the science itself was developed by chemists and doctors in the mid-19th century. The profession of undertaking, however, goes back much further and was often associated with a variety of other trades. Individuals known as "Undertakers" began to appear in England in the late 17th century. These professional men competed with the aristocrats of the College of Arms who previously dominated "both the form and management of funeral ceremonial for the English elite during the sixteenth and most of the seventeenth centuries." The political upheavels in England during this time, as well as the Crown's desperate need for cash, helped to open up the trade. 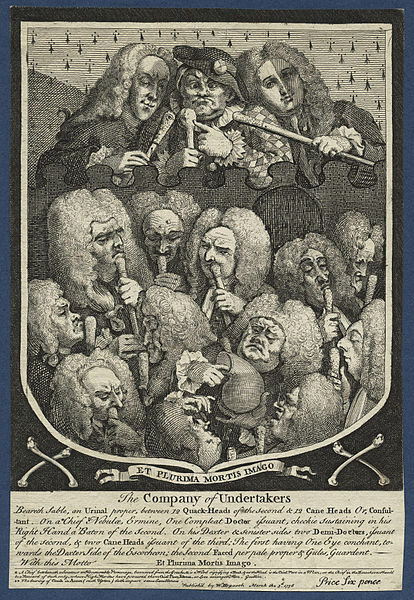 These early undertakers offered a variety of funereal services, like Thomas Salter in 1737, who kept his business "at the Four Coffins in the Old Bailey." He advertized that he "Makes and Sells all Sorts of Coffins and Shrouds at moderate Prices, he likewise furnishes Funerals, viz., Palls, Cloaks, Scarves and Hoods, Silk Hatbands, Crape Hatbands, Favours, Gloves, Feathers, Velvets, Hangings, Escutcheons, Sconces, Candlesticks, Stands, Wax Tapers, Branch Lights, Flambeaux, Tickets, With Hearses and Mourning-Coaches to any Part of England." 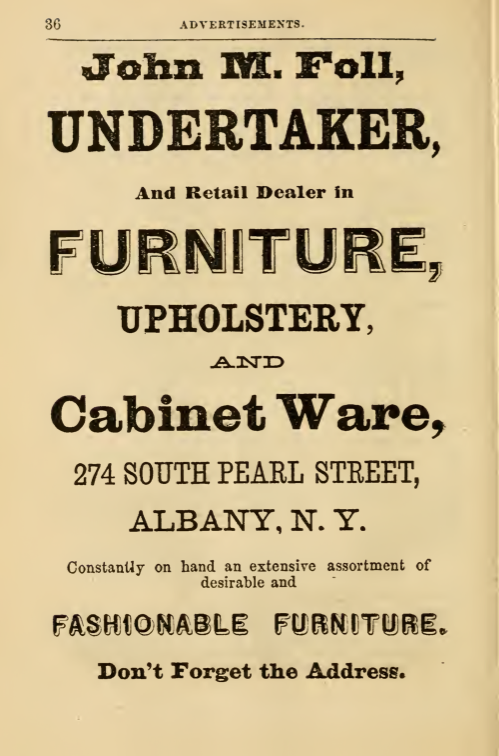 Very often, undertakers were in a variety of businesses, like upholsterers and furniture makers. This tradition would continue well into the 19th century. He is master of ceremonies at burials and mourning assemblies, grandmarshal at funeral processions, the only true yeoman of the body, over which he exercises dictatorial authority from the moment that breath has taken leave to that of its final commitment to the earth. His ministry begins where the physician's, lawyer's, and diviner's end...He is bed maker to the dead. The pillows which he lays never rumple. The day of interment is the theatre in which he displays the mysteries of this art. Across the pond, the rise of professional funeral managers who supplied the growing variety of mourning necessities was also allied to furniture making trades. Michael Jenkins in Baltimore offered coffinmaking in addition to his cabinet-making business as early as 1799. Many businesses that began offering funeral services as a sideline soon assumed it as their primary offering. W.D. Diguid was established in Lynchburg, Virginia in 1817. J.J. Shepherd and Son was in business in 1827 in Pembroke, Massachusetts. J.S. Waterman, a cabinet-maker, also began undertaking in 1832. Livery stables also began to get into the game. As people demanded more elaborate funeral displays along with hearses and the horses that pull them, livery keepers offered these items for rental and began taking on the management of the funeral in its entirety. An entry in the 1824 city directory of Baltimore shows a livery stable with undertaking services. 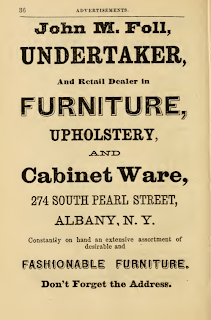 In 1856, the city directory of Providence, Rhode Island, states: Gardner T. Swartz, Livery Stable Keeper, Undertaker, Tomb Proprietor and Dealer in ready-made coffins, of all kinds and at all prices, near the corner of Pine and Dorrance Street, Providence. 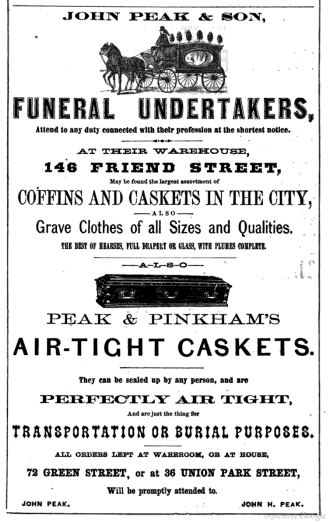 Soon, firms that specialized in supplying funeral accessories became known as "furnishing undertakers". By the time of the Civil War, the varied business that provided undertaking services also began providing embalming services as well. The case of William R. Cornelius is an interesting one. Cornelius was born in 1824 in Union County, Pennsylvania. He apprenticed as a carpenter and made furniture as well as coffins. At some point, he moved to Nashville, Tennessee and by 1849 was the foreman of the undertaking and cabinet-making business of McComb and Carson. By 1861, he was sole proprietor of the firm and focused exclusively on undertaking. He won the contract to bury the Confederate dead and when the Union army arrived in 1862, he got the contract to bury the Union dead at the same terms. He opened branch establishments in Murfreesboro and Chattanooga, Tennessee, as well as Stevenson, Huntsville, and Bridgeport, Alabama, and Rome, Georgia. He claimed to have buried or shipped to their homes over 33,000 war dead. In 1862, a Dr. E.C. Lewis approached Mr. Cornelius with a new embalming system he had acquired the right to use from Dr. Thomas Holmes in Washington, D.C. Cornelius states, "It was new to me, but I at once put him to work with the Holmes fluid and Holmes injector. He was quite an expert, but like a great many men, he could not stand prosperity, and soon wanted to get into some other kind of business, which he did." I suppose I embalmed and had embalmed some 3,000-3,500 soldiers and employees of the U.S. Army. Embalming was not introduced until after the Confederate Army left, so I did not embalm any Confederates. I embalmed and shipped General McPherson, General Scott and General Garesche. The latter had his head shot clear off. I shipped nearly all of the Anderson cavalry to Philadelphia at one time. After the fight at Stones River, I shipped colonels, majors, captains and privates by carloads some days. When Lewis, the embalmer, quit, I then undertook the embalming myself with a colored assistant named Prince Greer who appeared to enjoy embalming so much that he became himself an expert, kept on at work embalming during the balance of the war, and was very successful. It was but a short time before he could raise an artery as quickly as anyone, and was always careful, of course coming to me in a critical case. He remained with me until I quit the business in 1871. What happened to Greer? Did he continue in the business for himself? Cornelius tired of retirement and by 1879 was back in the undertaking business. 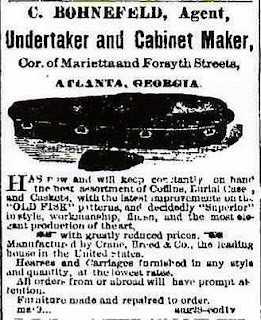 The Nashville city directory of 1901 still showed the firm of W.R. Cornelius, undertaker, now run with his sons, B.F. and William, Jr.
My own family has its association with undertaking and embalming. According to family history, my great-grandfather was the youngest licensed embalmer in the state of Illinois. 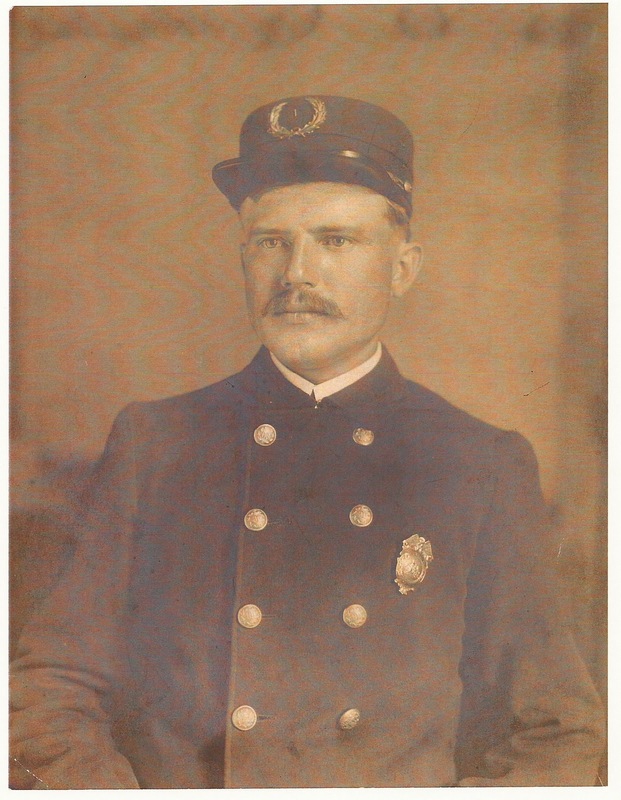 Henry P. Schwarz was born on September 19, 1887 in Kansas City, Missouri. His father had died before his birth and his mother died shortly after, perhaps in a typhoid epidemic. He was adopted by Matthias and Caroline Schwarz of O'Fallon, Illinois. 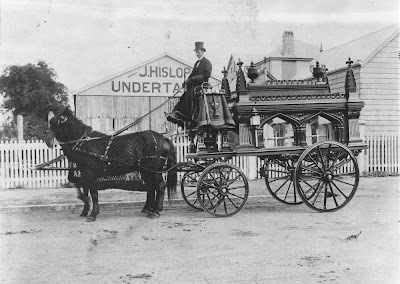 The Schwarz family owned a furniture business that had a sideline in funeral undertaking and at the age of 13, Henry became licensed as an embalmer. He practiced his profession for 45 years at the Schwarz Furniture and Undertaking Company. From his obituary: "He once operated the old Taylor Opera House where early motion pictures such as "The Birth of a Nation" were shown during World War I. Mr. Schwarz retired from the O'Fallon Fire Department after 40 years service in May 1946." Fritz, Paul S., “The Undertaking Trade in England: Its Origins and Early Development, 1660-1830”, Eighteenth-Century Studies, vol. 28, no. 2, (1994-1995). Habenstein, Robert W. and Lamers, William M., The History of American Funeral Directing, National Funeral Directors Association, 1981. Walker, Juliet E.K., “Racism, Slavery, and Free Enterprise: Black Entrepreneurship in the United States before the Civil War”, The Business History Review, Vol. 60, No. 3, Autumn, 1986. Congratulations on a well-written and enlightening article. Please note, however, that the second author of "History of American Funeral Directing" is William M. Lamers, not Lamb. It is a remarkable book of in-depth information about the mortuary profession with special emphasis on the nineteenth and early twentieth centuries, and you were wise to consult it in compiling this article. Hi Shelley! Thank you so much for taking the time to read the piece. I'm so glad you enjoyed it. And thank you VERY much for that great catch--I will update William Lamers name right away!